Oil prices are trading higher this morning as markets shift their focus from Iran and elections to OPEC production quotas. 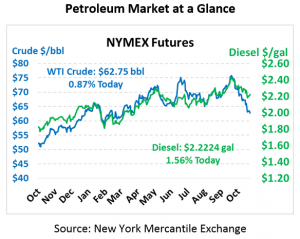 After shedding nearly a dollar yesterday to close at $62.21, this morning crude prices are $62.75, a 54 cent gain. Fuel prices are also getting a boost this morning. Counter to recent trends, yesterday gasoline was the strongest performer, remaining in positive territory while diesel and crude prices fell. This morning, diesel prices are trading at $2.2224, a large gain of 3.4 cents. Gasoline prices are trading at $1.6986, a characteristically weak gain of 0.5 cents over yesterday’s close. The API released their weekly inventory report yesterday, which showed a much larger than expected crude inventory build of 7.8 million barrels. 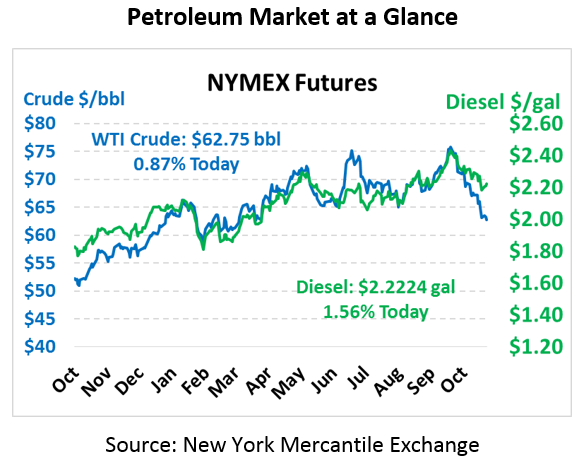 Markets are expecting a much lower build for crude stocks this week accompanied by moderate stock draws for gasoline and diesel. Should the EIA echo the API’s bearish numbers, oil prices could face some headwinds this afternoon. As we’ve noted in previous analysis, OPEC is a major factor that could keep oil prices elevated over the coming year. A group of OPEC members and allies such as Russia will meet on Sunday to discuss oil market trends and outlooks for 2019. When asked whether they would consider extending quotas into 2019, Reuters quoted an OPEC delegate responding: “Certainly not the other way around.” OPEC has expressed comfort with Brent prices in the $70-$80 range (WTI in the $60-$75 range). While the group meeting Sunday will vote to actually effect production changes, their recommendations will be influential when OPEC leaders meet Dec 6-7 to decide on future OPEC policies. As was the case in 2016 and 2017, expect markets to hang on every word coming from OPEC in the meantime.